It's been quite a while since I've written about my adventures. It's not that I haven't had adventures, in fact really excellent adventures, but I have been a writing slacker ever since graduating nursing school (which was a whole different kind of adventure). One of the best bike trips from recent memory (even though it's the only bike trip from recent memory) was with my good ol' buddies in the Goosebumps group, with whom I had been a regular rider for a number of years. 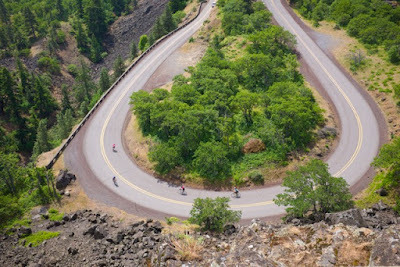 I was already planning a trip to the Columbia River Gorge area when Dottie, one half of a tandem with Orin, told me about a weekend of cycling in the Hood River area. After making arrangements with work (read: after working a double shift to make up the time), the wheels were in motion for an excellent extended weekend. We stayed at the Vagabond Inn which overlooks the Columbia River. Well, if you pony up the money for a fancy room. I opted for a "courtyard" room which was spacious and had space for doing yoga post-ride... priorities. There were two restaurants next door, one a greasy spoon, the other fine dining and town was a quick ride or drive away. The first morning, I rode my bike downtown to KickStand Coffee & Kitchen which is owned by a guy who is obviously a bike racer, judging from the long, lanky looks of him. He is also an excellent business owner and chef, as my tastebuds and tummy can attest. Over the course of the weekend, I would go there a couple more times, each time introducing more people from the group to their food, coffee and ambience. But first, the rides. I got a ride in Phu's car, along with Bill, to the start of the first day's route, from an area just west of Hood River. It was a mixture of quiet roads and even quieter trails; there was some serious Oregon-envy from early on when we weren't honked at and didn't even ride over any potholes. The only thing I found lacking in the route was toilets – it was warm, I was hydrated and there was nowhere to go. And then there was the stairs. They were kind of steep and led from the trail above the freeway up to the trail in the woods. We managed, but clearly, this was not the perfect solution. However, soon we arrived at Multnomah Falls where it was time for photos, eating a giant cookie and lounging around doing some people-watching. On the return trip, we waited 45 minutes in a line for ice cream at Cascade Locks, a town most famous for the Bridge of the Gods which the Pacific Crest Trail passes over (brings back memories from years ago, in fact). Stairs. On the bike trail. Yep. The next day, Sunday, which was also Mothers' Day we started out by four of us going to KickStand for breakfast. My table-mates were relieved to not have to repeat the experience at the greasy spoon. Then, we got on our bikes and headed east this time, through town and up some crazy-looking switchbacks to another section of the scenic trail. Again, no bumps, potholes or cars and the improvement for today was the availability of toilets. Yay! After the trail, which had many scenic pullouts and meadows full of wildflowers, we climbed in the hills toward Rowena. There were some cars, but they were well-behaved. The scenery was full of old oak trees, grassy hills and views of Mt Hood, directly to the south. When we reached the Rowena Crest, there was a decision to be made: to go down the Rowena Curves to the Dalles and have to climb back up, or turn around at the Crest. Phu and I had just been talking about the ideal climbing grade, which we agreed was from 4 – 6% and there on the history placard was information that the curves were from 4 – 6% grade. Dave joined us and away the three of us went, with Bill as our photographer from above. It was not important to reveal who was the first to reach the crest on the climb back up as it was to recognize that this ride was going to be one of the best, if not the best, rides of the season. Of course, on our way back through town, we stopped at KickStand once more and enjoyed their espresso and a fantastic strawberry shortcake that the owner whipped up.